About two weeks ago, I wrote that I wanted to have a Mexican meal out, after having spent an evening reminiscing about my friend, Erica. Then, allergies set in and got the better of me – rendering me useless over the past weekend. I had made plans to go out to dinner with friends, and was so bummed to cancel my plans on Sunday, but I physically could not eat! My throat was that swollen and sore! So, today, I went to lunch with a friend of mine, Jess, as I often do. Normally, we go to one of a handful of local places (mostly chain restaurants nearby the office). Seriously, we don’t have to ask each other, we just turn right out of the parking lot and go up to “the hill” for Panera, Chili’s, Qdoba, etc. We typically make the decision once we’re nearing “the hill”. For some reason today, Jess mentioned that there is a little Mexican joint nearby that she had been to with another coworker. We decided to go there – because Jess mentioned it was good food, dirt cheap, and the place is hopping at lunchtime. 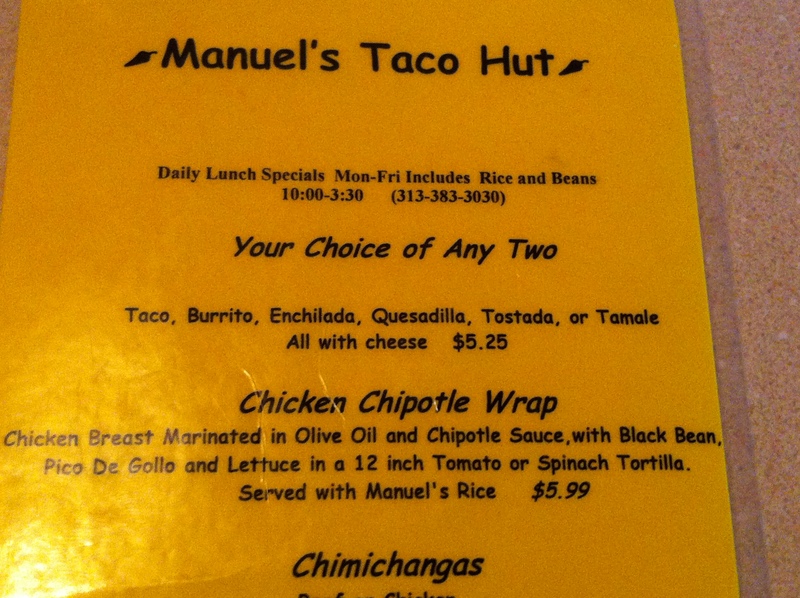 As we pulled into Manuel’s (Manny’s) Taco Hut, we noticed that the parking lot wasn’t too crowded today. Odd, but it probably worked in our favor. We sat down, took a look at the menu, and I instantly decided that I would just let our server choose something for me. When she came to take our order, Jess gave her order, and I told the server that I’d like to her choose her favorite meal and surprise me. Her response? “Seriously? Okay!” Then, off she went. She was awesome about it! Jess and I chatted about a myriad of things, mostly physical fitness (ironic, seeing as how we were intending to gorge on Mexican food!) while waiting on our meals. Thinking back, it fit perfectly with my desire to post about Mexican dining. My last meal with Erica and her husband was lunch at a Mexican joint in Orange, CA. I had spent the afternoon with two really wonderful people, enjoying their company, laughing, and just having a good time with friends. Not unlike today’s lunchtime outing with Jess – an equally wonderful person and friend. I’m really glad we went to Manny’s – on a whim! A few minutes later, when our lunches were delivered, Kelly, our server, laid down a plate of “healthy food, for under 6 bucks” in front of me. 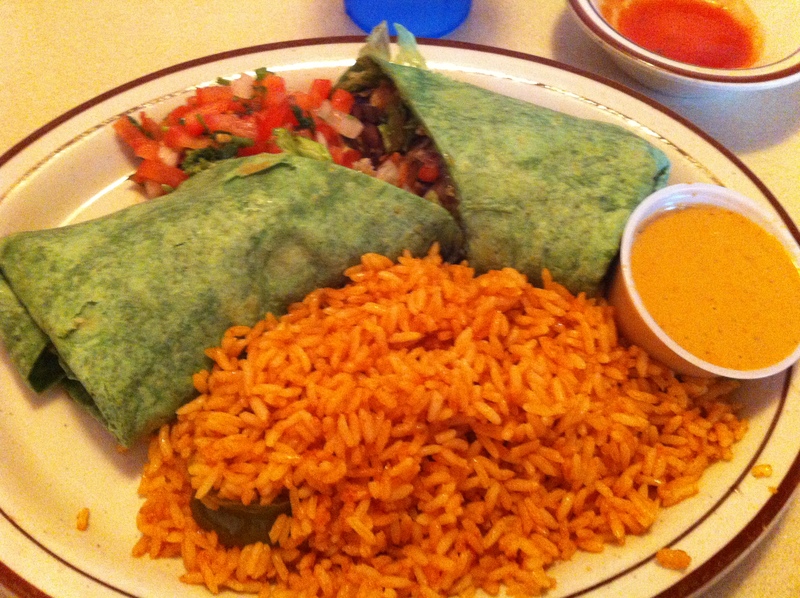 She explained that she chose the chicken chipotle wrap, which consists of chicken marinated in olive oil and chipotle sauce, with pico de gallo, black beans, and lettuce, served in a spinach wrap, and with Manuel’s rice. She also mentioned that the chipotle sauce was spicy so, “dip before pouring”. She was right – it had a kick to it, but I ended up pouring anyhow! The wrap was delicious – very flavorful. Filling, but not overly so. And, it was also quite messy! I certainly wouldn’t order it on a date, but in the company of a very good friend – it was all good! When Kelly dropped the bill off, she said that this was really fun for her, and thanked us for giving her the experience. It was so nice to see yet another server enjoy choosing a meal for one of her diners. And, this diner definitely enjoyed the meal chosen for her! She left us with the (inexpensive) bill, and a smile! And, I will add Manny’s to the list of local joints we should get out and enjoy on our lunch hour!